I went up North to Pleasanton, California for the ZNEcon. A 3-day art retreat. What fun! The best part was all the wonderful women I met and the art they do. Miss Vicky of Cut-it Up reserved some rooms and we partied making doll clothes and having fun. You can check out my blog for Blythe dolls. EdwardandEternia.blogspot.com for a wedding that took place at ZNEcon. I took a class with Lisa Kaus and had so much fun and learned some great techniques. I'll post my work later. Right now I just want to post pics of the event and our gatherings. Hope you enjoy. BLOG-Her Party at La Maison Rustique ala "The Barn"
7am Meet my friend Susan in front of Starbucks in Temecula. She follows me to "the barn"
We unload both cars, put up a tent and start "building" our store. I get a chance to take a quick peak at some of the other great booths setup all around us. 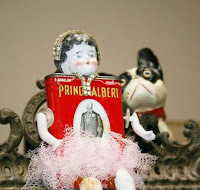 Wonderful, fun, vintage, shabby chic, parisian, beachy, strange, beautiful, artistic and more. Lots of people, fun to meet and shop. Noon, I think it's 90 degrees but thankfully I don't have a temp gauge to confirm. Susan and I take off down the road, ahhhh the air conditioning is cool and refreshing...love it! We get to Starbucks and Susan hops off to the restroom....hmmmm she seems to be gone for a long time.........she comes back, she laughs I gave my feet a little bath. I said how did you get your feet in the sink ha ha No, no she just wiped them down with paper towels. We order and drink water, enjoy the coolness as long as possible and then off we go back down the road to the barn. Jane gets her drink and sandwich we sit and try to stay a little cool. I walk off and visit and take a few pics. Truly some wonderful art available here. The Blog-Her party was in full swing with wine, lemonade, lemon bars, cakes and more. I came back to Susan and said I don't feel well, I just have to leave. So we packed up fast and I never thought I would make it.......each step I kept thinking just a few more things. Susan, helped me sooo much and I thank my lucky stars she was there. She sells purses and only sold one....she realized the ladies were more interested in vintage and shabby chic than designer bags today BUT she never lost her smile. 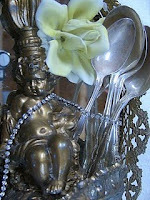 Ceilia P. Hidalgo So sad no blog, but she has such beautiful shabby chi decor and does wonderful things with jewelry. Now I know I probably missed a couple booths and cards. So if you were there, please email me and I will be happy to add you to my blog. Here's some pics to let you see how FAB it was! Heat or no Heat it was a wonderful experience. Tuesday, August 12th Bonnie and myself went to Georgia's to take a class on making Heritage Dolls. Wow what fun we had! Georgia had lots and lots of great empherma, stamps, inks, paints.....well you get the picture. I have added some pics of her art room and some of her great paintings that she does. Fantastic pieces of art and whimsy. We had to leave early for other errands so we didn't finish our Heritage Dolls but when I do, I will post a pic. They are adorable. I am making separate posts as I want you to see what we will be doing for art day meetup. Georgia will be our guest instructor. Okay ladies, if you haven't visited La Maison Rustique (as I call it The Barn Sale) this is the month to do it. It is open Friday, Saturday and Sunday but on Saturday, August 16th from 2 pm to 7 pm will be the Blog-her Party. Lots of vendors with wonderful blogs and wonderful merchandise will set up tents at the Barn. So it will be a shopping, party atmosphere. La Maison Rustique blog has more details along with the address but let me tell you it's pretty easy. Take Highway 15 up North to Temecula get off at Rancho California and head East, keep going into the wine country and you will see signs alon the road side taking you directly to the sale. I will have a booth sharing it with my friend, Susan who sells designer handbags. I am busy getting my items ready for the sale and thought I post some so you can see what I will be selling. Check out my new dress form. I call her Madame Ta Ta and I love her. Hope to see you at the Barn for a big Blog Her Party.